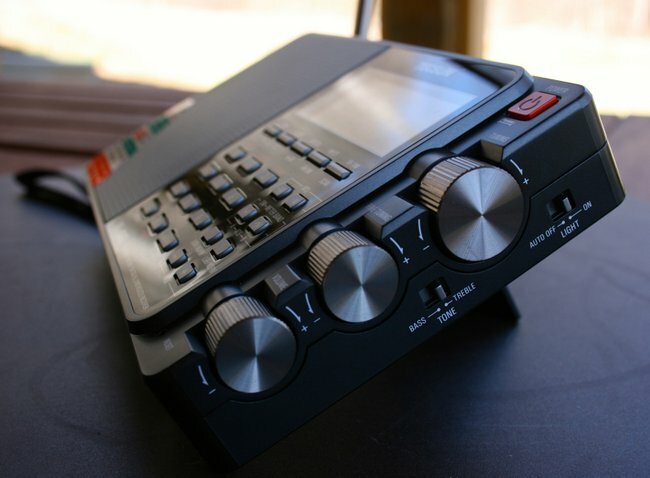 “I have been using the Tecsun PL-600 for some time but never was satisfied with its performance in SSB, you can read my review on eham. Last night I received the PL-880 I purchased trough amazon.com and I am really impressed with its performance, its a day and night difference compared with the PL-600, especially for SSB–the addition of narrow filters for LSB and USB made a huge improvement to the performance, also the availability of choosing different BW either on SSB or AM also improved a lot the reception. Turn the radio ON, select FM, and go to freq that be in between two stations–an empty frequency–in my radio it will sound like complete silence because the squelch circuit is acting properly and majority of users will prefer to leave it like that to avoid the squelch noise BUT that decreases receiver sensitivity a few microvolts on FM, so because I am a dxer in any band, I reset the squelch threshold to have permanent noise or “open squelch” condition. Many thanks, Hector! I’ve added this to the Tecsun PL-880 hidden feature list. The ability to lower squelch is, as you say, essential for FM DXing. Note that I tried this hidden feature on my Tecsun PL-880 and it didn’t work. My FM muting threshold must be set to 0, however, because I can hear static between stations. Tecsun must have made this addition after my radio was produced (mine came from one of the first ‘880 shipments in November 2013). Have any other SWLing Post readers tried to adjust the FM muting threshold on their PL-880? This entry was posted in Articles, How To, News, Radio Modifications, Radios, Shortwave Radio and tagged PL-880, Tecsun, Tecsun PL-880, Tecsun PL-880 Hidden Feature, Tecsun PL-880 Hidden Feature FM muting on July 31, 2014 by Thomas. My unit shows the same figures Thomas, 8820 and Nov 13th, 2013. When you set the level to 05 in AM mode, did you test the FM mode to see if the static level between stations changed? It would be a big, noticeable change from 00 to 05. I can think of no reason with identical dates of manufacture this should work on one radio and not the other. You may want to consider getting a replacement. I am my on my 3rd radio now, and this one finally looks OK.
My firmware shows 8820, date of manufacture April 30, 2014. I checked your tip but it has no effect, on FM at least. I set DNR to ON (in AM mode since the #6 key has no effect in FM), then switched to FM, pressed the #9 key : nothing (but it does work in AM/SSB, showing ’00’ level’). Try setting the level to 05 in AM mode, then switch to FM and see if that setting carries over. It does on mine. When I set the 9 key setting from 00 to 05 (the max I can get in FM) in AM mode, the switch to FM and press and hold the 9 key, it shows the 05 value I entered in AM mode. The static between stations in FM mode is dramatically reduced as well, so it is working! I’m getting the impression that this only works with some of the latest PL-880 models. We should probably compare firmware and manufacturing dates. As I mentioned, this feature does not work on my PL-880, but it appears muting is already set to “0” (where I would want it). My firmware is 8820 and manufacture date November 13, 2013. You are probably right that it works only in newer radios (my is 8820/140430 and it works). But I’m not sure about ‘set to 0’ in your radio, because for me looks like in the FM this is not squelch but some kind of gain control. I can change it from 0 to 5 (default 3) and in free freq I always hear static – just loud (0) or very silent (5). But on used freq I don’t hear difference in loudness, so I think about AGC and not gain itself. Also I have different settings for MW (looks as soft squelch – 0-40). The adjustment on the 9 key is linked to the DNR on/off toggle controlled by the 6 key (on later units this was changed to the 4 key). Try pressing and holding the 6 (or 4 if the 6 does not work) until the display says “on”. The 9 key function should now work. Thank you John, this worked for me. Now if I can get mine to use external antenna in MW and LW this little thing will be perfect. I cannot change the FM muting threshold with my unit. Mine has the 8820 firmware with a display date of 13/11/13 and a battery compartment date of 12/2013. I do hear squelch noise between stations now. It sure would be nice if Tecsun would release a new and improved firmware update, I guess I just assumed when I bought the radio there would be future firmware improvements released but now that I think back Tecsun never promised there would be. It will be interesting to see how the PL-880 compares to the new Eton Satellit, if Eton improves the sync compared to the G3 and enhances the speaker then things could get interesting. Yes, it does work for me with a 8820 140430 date.